Warner Bros. and DC Entertainment have had quite the rough time getting their DC film division in order, having dealt with corporate restructuring, a messy release slate, an (abandoned?) shared cinematic universe, and—minus Wonder Woman—a series of moderately successful but not especially beloved installments. With the launch of new digital subscription service DC Universe, however, DC is looking to create a more cohesive streaming experience. 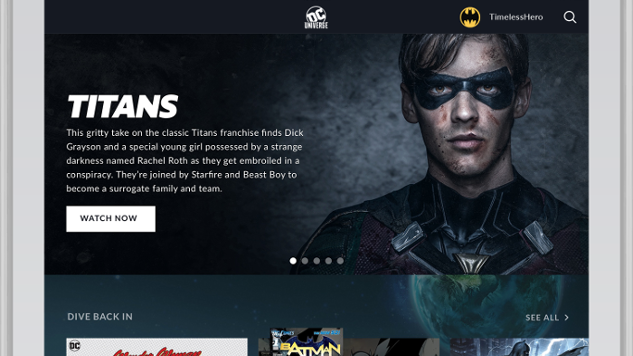 The service will launch on Batman Day, Sept. 15, and includes original television programming, access to select DC TV shows and films, and a “curated selection” of digital comics, in addition to forums and merchandise. The original programming includes DC Daily, a daily news show “focused on all things DC” and hosted by Kevin Smith, which announced the launch date for the new service on Wednesday night. Also announced was a debut date—Oct. 12—for Titans, a weekly, DC Universe-exclusive online series, with a world premiere set on Oct. 3 at New York Comic-Con. The show’s first season will run 12 episodes. At the time of DC Universe’s launch, fans will also be able to watch the first two seasons of Young Justice, which aired on Cartoon Network, prior to the debut of Young Justice: Outsiders in 2019. Membership to the new service will run $7.99 per month or $74.99 annually. Paste’s own Jim Vorel wasn’t impressed by the under-lit, cheap-looking first trailer for Titans, and it’s hard to picture the new service gaining much traction outside of established DC diehards. Hiring noted fanboy Smith to host a daily show all about DC news and commentary reads as a play to the base, rather than to mainstream audiences. The new service will also avoid crossing over with The CW’s ‘Arrowverse’—comprising Arrow, The Flash, Supergirl and Legends of Tomorrow—the shared universe of hit network shows that has successfully, if quietly, anchored DC’s television efforts up to this point. These comic book universes don’t all necessarily have to be connected; Marvel Studios head Kevin Feige has a famously contemptuous relationship with the studio’s television division and its continuity with the world-conquering Marvel Cinematic Universe. But to this outsider, DC’s strategy is looking pretty insular.